For a wide variety of health reasons, I have to use products that are paraben and gluten free. Finding body lotion that actually meets this criterion, and that makes my skin feel soft and look healthy is a lot harder than you might think. So, when I was shopping the other day and ran across Hempz Pure Herbal Extracts, I was immediately intrigued. So why is hemp seed oil suddenly so popular? Actually, the use of hemp is nothing new. In fact, the use of hemp is documented as far back as 10,000 years ago in what is modern day Taiwan. Throughout history it has been used for soil cultivation, building materials, clothing, medicinal purposes, and beauty products. Hemp has often been mistaken for marijuana. Although both come from the Cannabis species and look similar, their use and effects are widely different. So, what are the differences? Hemp is used in clothing, food, plastics, cars, building materials, and health and beauty products. Marijuana is used primarily for recreational and medical purposes. THC (tetrahydrocarniabinol), which is a psychoactive chemical, is less than 0.3% in hemp, while strains of marijuana can have anywhere from 5% to 35%. Due to the high levels of THC marijuana is considered a psychoactive agent, while hemp is not. Another difference between the two plants is that hemp can be grown in almost any kind of environment and is highly adaptable. Marijuana, on the other hand, is not as easy to cultivate and requires a greater amount of care. In fact, hemp is actually high in cannabidiol (CBD) which is the opposite of THC and counteracts its affects. Interestingly, CBD is found to have many health benefits. It has become a popular supplement that helps relieve pain, reduce inflammation, and calms anxiety without any of the negative psychoactive effects. Although hemp is found in a wide variety of products, body lotions use hemp seed oil as one of its key ingredients. Hemp seed oil is extracted exclusively from the seed of the plant and is refined or unrefined. Unrefined hemp seed oil is used as an additive to foods such as salads or smoothies and is a favorite to many, for its mild, nutty flavor. Refined hemp seed oil, on the other hand, is used in beauty products. Although it does not have some of the nutritional benefits of the unrefined oil, refined hemp seed oil is still very beneficial for the skin. Hemp seed oil contains vitamins essential for the skin. It includes Vitamins E, which is an antioxidant known for promoting natural cell regeneration which helps to prevent wrinkles. Vitamin C is another powerful antioxidant that aids with promoting collagen reproduction and gives the skin a fresher and more youthful appearance. Vitamin C is also known to help skin with moisturization and hydration. The B vitamins (B1, B2, B3, and B6) are another nutrient that makes hemp seed oil ideal for body lotion. Vitamin B2 helps to break down food and deliver nutrients to the body. Without this vitamin, skin regeneration is negatively affected. Vitamin B3 is known for making the outer skin stronger so that it can retain moisture longer and appear more youthful. Key minerals found in hemp seed oil are iron, potassium and zinc. Iron is beneficial because it gives skin a youthful glow and reduces paleness. While potassium is a mineral that enables the skin to stay moist and well-hydrated. Zinc is another important mineral in hemp seed oil that is an antioxidant with healing and regenerative properties. In addition to providing vitamins and minerals, hemp seed oil is also an excellent source of essential fatty acids. It contains a 3:1 ratio of Omega-3 and Omega-6 linolenic acids. These nutrients are anti-inflammatory and assist the skin with natural exfoliation. Because of this, essential fatty acids help the skin retain moisture and slow the aging process. Another benefit of hemp seed oil is that it helps to control oil production. So, lotions contain hemp seed oil will prevent clogged pores without causing dryness. Besides all of this oil’s amazing healthy benefits, it is good to know that hemp is a renewable and sustainable resource. Unlike products that developed from petroleum, wood, and cotton, Hemp does not need the harsh chemicals in order to process it. In fact, hemp found across many industries in over 25,000 products. So, the next time you shop for lotion, give Hempz Pure Herbal Extracts or other similar products a try and be good to yourself and the world around you. The popular original scent of Hempz Pure Herbal Extracts is enriched with pure hemp seed oil and nourishes and hydrates skin. It is gluten-free, paraben-free, THC-free, and 100% vegan. It contains Vitamins, E, C and A which helps to protect skin from environmental toxins. This lotion is enriched with pure hemp seed oil and is paraben-free, gluten-free, THC-free, and 100% Vegan. The extra benefits of Vitamins A, C, B5, and E protect skin against the harmful effects of environmental toxins. Additional anti-oxidant properties come from a blend of green tea, acai berry, goji berry, and pear. 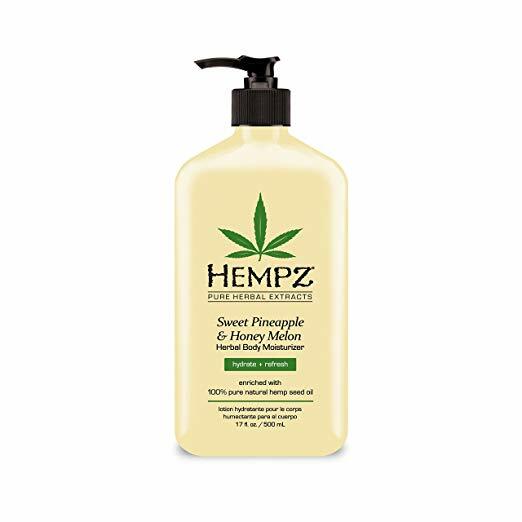 Hempz’s Sweet Pineapple and Honey Melon lotion is gluten-free, paraben-free, THC-free, and 100% vegan. It is also enriched with pure hemp seed oil, which adds additional nutrients that hydrates, nourishes, and protects the skin from environmental oxidants. The combination of Hemp Seed Oil and Argan Oil leaves the skin radiant, smooth, and healthy. This nourishing lotion restores smoothness and shine to skin with its rich ingredients that include Vitamins A, D, and E and essential fatty acids. It is 100% Vegan Peta Certified and organic. This all-natural face cream is 100% toxin free. The vitamins and minerals included in this nourishing formula provide anti-aging benefits that restore a youthful glow by reducing fine lines and wrinkles. Eye cream that is specially formulated for the sensitive skin around the eyes. It is enriched with essential fatty acids that restore a healthy glow and reduce wrinkles and fine lines. 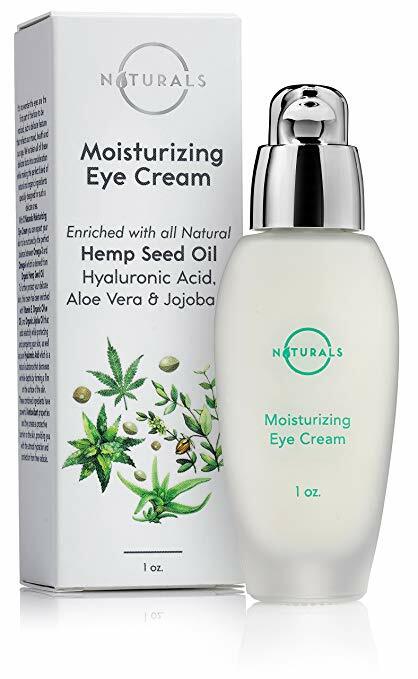 This Organic moisturizing eye cream is 100% toxin free.